IIT Bombay (Indian Institute of Technology Bombay), Mumbai published a new job notification for Jr. Technician Posts. The recruitment is for total 02 Vacancies. The willing candidates are informed to see the latest notification March 2019. Last Date of Online application is 18-04-2019. 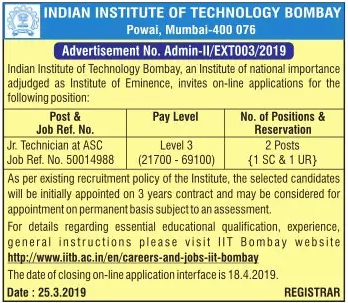 For More details of IIT Bombay Recruitment 2019 Read Below. Interested & Eligible candidates can apply Online through the website www.iitb.ac.in earlier than the due date. Application starts Online 27-03-2019. Last Date of application is 18-04-2019.